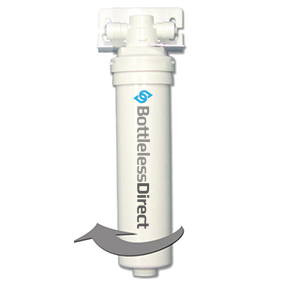 Bot­tle­Less Direct offers you two options when it comes to water filtration – Micron Filtration and Reverse Osmosis. It’s Like 5 Filters In One! The BottleLess Direct Twist-Off Purification System is the ultimate “user friendly” filter on the market. Replacement of the cartridges is completed in a matter of seconds. You just detach the filter body from the permanent head with a twist of the wrist. The new filter cartridge is just as easily replaced by threading it into the head. The BottleLess Direct Micron purification system has been tested to NSF performance Standard 42 and Standard 53. It is independently certified for chlorine, lead, cysts, bad taste and odor reduction. Specifically, it is a 1 micron, block, granular activated carbon filter with lead reduction media. It is certified for 1,200 gallons which equates to drinking 240 of those big five-gallon bottles. 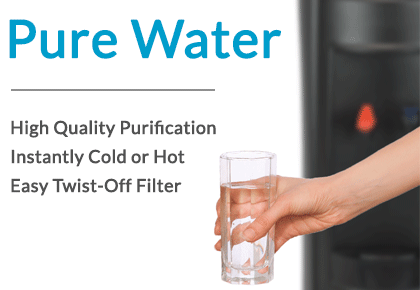 For parts of the country where there is an extremely high salt concentration in the municipal supply, BottleLess Direct recommends that you upgrade your purification technology to reverse osmosis. Reverse osmosis removes more than 85% of the minerals from their water (in addition to the things removed by our Micron Purification). Salt is a mineral – so RO is necessary to make this water taste delicious. Basically, you’re left with just H2O. This is the same process used to turn ocean water into drinking water (otherwise known as desalination)!